Chinese solar stocks are struggling, but what will bring them back to life? China owns a dominant share of the global solar module market, but you wouldn't know that by looking at the performance of the country's largest solar companies. Over the past year, the stock of nearly every one of China's solar manufacturers has plunged. As you can see below, Trina Solar (NYSE:TSL), Canadian Solar (NASDAQ:CSIQ), and JinkoSolar (NYSE:JKS) have all struggled while Yingli Green Energy (NYSE:YGE) has fallen off a cliff. Why is this happening in a booming solar market? The answer lies in finding where the value is created in solar today. Over the past decade, value creation in the solar industry has changed hands a number of times. Equipment suppliers like GT Advanced Technologies once made a lot of money selling PV equipment to module manufacturers. Polysilicon was once a highly valued material from companies like LDK Solar. And module makers like Suntech Power couldn't make modules fast enough to meet demand in the late 2000s, leading to booming profits. The one thing all three companies have in common is that they're all bankrupt now -- so success today doesn't necessarily mean success tomorrow. Today's solar industry has seen the value creation shift to system builders and companies who can sell solar to millions of residential customers around the world. That may not be the case forever, but it's where the industry stands today. That's why companies like SolarCity and SunEdison can be worth billions of dollars simply by installing panels made by Trina Solar, Canadian Solar, JinkoSolar, Yingli Green Energy, and others. These Chinese companies are trying to move downstream, especially into the utility-scale system business SunEdison is in, but even that strategy has its challenges. Tariffs in place in the U.S., Canada, and Europe have made it hard to build systems outside of China with panels made in China. In China, subsidies promised by the government have been slower to arrive than many builders expected, and interconnection to the grid hasn't been as simple as you might think. Another big problem these Chinese companies have is that they're selling a commoditized product. In essence, they all make the same product on similar equipment, so why would customers, from developers to utilities, pay a premium for product from any commodity supplier? Whether it's panel efficiency, inverter capabilities, energy management, energy storage, or financing, solar companies are looking for any edge they can get over competitors. But as I mentioned above, Chinese solar manufacturers have focused on buying off the equipment to build capacity, meaning they aren't building technological differentiation. What's concerning long term is that they aren't very focused on changing that dynamic. The four Chinese manufacturers I've looked at today spend little more than First Solar on research and development annually. And First Solar makes a profit despite that investment in the future. 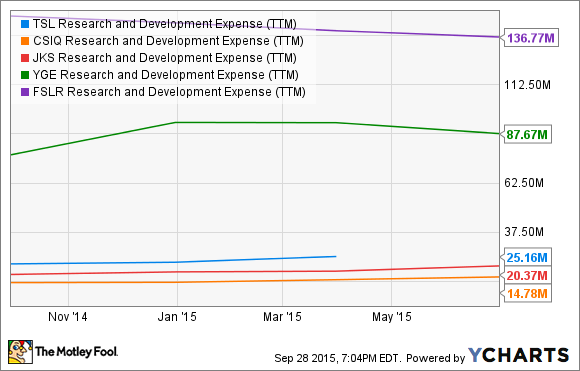 TSL Research and Development Expense (TTM) data by YCharts. This is a problem with Chinese solar manufacturers that seems to cycle around the industry, but it never fixes itself. Suntech Power, LDK Solar, and Yingli Green Energy seemed to be leaders in the solar industry until debts grew out of control and investors realized they weren't spending enough on R&D to demand a premium price for modules. Without differentiation, solar manufacturers are battling on price, and that's an uphill battle I wouldn't want to be fighting. The solar industry is growing in the U.S. and in many countries abroad, but that doesn't mean every solar company is going to make money. The abysmal performance of solar stocks this year shows that, and with losses mounting for many companies, the stress may not be over. China's main problem is that it's built solar capacity that's not differentiated from that of other manufacturers, leaving each company to fight for market share and survival in a commodity market. Meanwhile, U.S. manufacturers that are focused on technology differentiation are making money and differentiating themselves in the solar industry. Long term, that's where the value is, and that's why the Chinese solar industry has an uphill battle ahead. 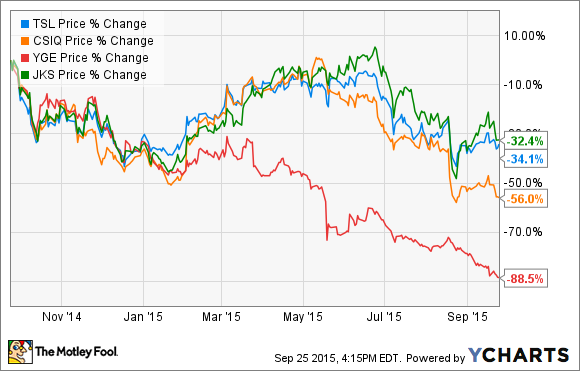 Time to Buy Yingli Green Energy, Trina Solar, and JA Solar?